Community market reports are the most valuable tool for home sellers. List prices only share what homes currently on the market are listed at, and offer no historical information. Market reports give a wealth of data including sold prices, number of days on the market, original listing prices and listing details. Fill out the form to receive by email a monthly market report for your community. It is the best way to stay on top of real estate trends in your own neighbourhood. 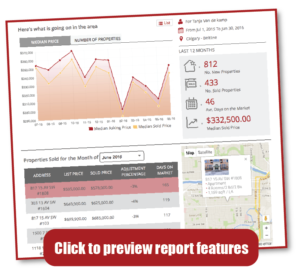 With data going back 12 months, market reports offer insight into Calgary real estate trends of your own community. View a sample market report. This report is similar to what you will receive every month, except your report will be interactive and customized for your community. Stay up to date with the real estate in your community. Sign up for free Calgary market reports today! While market reports give invaluable information about sold prices and more, a comparative market analysis is the best approach if you are looking to sell your home in the near future. This no-obligation home analysis is the best way to determine how much to list your home in today’s market. Start your home search today. Market reports can be helpful to learn about the trends in a community, but a personalized home search will help you find the perfect home. If you are playing with the idea of putting your current home on the market, sign up for the monthly market reports to get the inside scoop into real estate in your own community.